Course Introduction A 3 day course aimed at the worker who needs to use abseiling / Work Positioning as their method of access. The course follows BS 7985 2002: standards for Industrial rope access and looks at basic principles including access, ascending, descending, transfers, fundamental rigging and rescues. 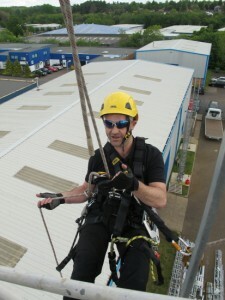 This course is aimed at a person who will be supervised whilst working at heights in an abseil method of work. Prerequisites Minimum age 18 and a good level of English and a fit for work declaration will need to be completed before start of course. It would be desirable the student has already attended a Working at heights or rooftop top access course before attend to gain full advantage of the 3 days.